The truck carrying the beer was a semi-tractor trailer, and the truck carrying the chips was a smaller box truck. The accident occurred around three in the morning in Florida, and while neither driver suffered any personal injury in the accident, there was beer and chips all over the highway. The accident occurred when the box truck was stopped along the shoulder of the road when it experienced engine trouble. Witnesses say the driver of the semi-tractor trailer swerved to avoid hitting another vehicle, and as a result of this maneuver, crashed into the stalled truck on the shoulder of the road. When the semi-tractor trailer collided with the truck carrying the chips, the box truck rolled over spilling its cargo all over the road. The road was closed for several hours during what turned out to be a large scale cleanup effort. A road crew with a front end loader was called to the scene to clean up as much of the beer and chips as possible. One state highway patrol trooper described the scene as the perfect setup for a Super Bowl commercial. The driver of the semi-tractor trailer was issued of a moving violation citation for failure to maintain a single lane of travel. The other driver was not issued any citations as his vehicle was pulled over into the breakdown lane and was in fact broken down. It should be noted that the driver of the truck who was cited for a moving violation has the opportunity to challenge the ticket, and may not ultimately be found liable for any infractions. 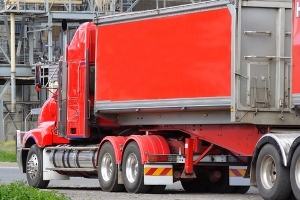 It is lucky that nobody was injured in this accident, however, in the case of many other Boston truck accidents, there is often serious bodily injury to one or more persons. One of the most important things you can do if you are involved in an accident that is someone else’s fault is to make sure you call the police, and do not just exchange insurance information. If possible, you want to make sure that the officer generates a vehicle crash report, so that you can get a copy of that report so that your attorney can use it help get you a full and appropriate financial compensation for any and all losses you suffered as a result of the accident. It is also important to never refuse medical attention. If the paramedics or EMTs offer to provide you with any treatment on the scene, you should always accept their help. You should also accept a ride to the hospital if they recommend you should get checked out. While some do not want to go through the whole process, and figure they can go by themselves later, it is best to go in the ambulance.